It’s the most wonderful time of the year! 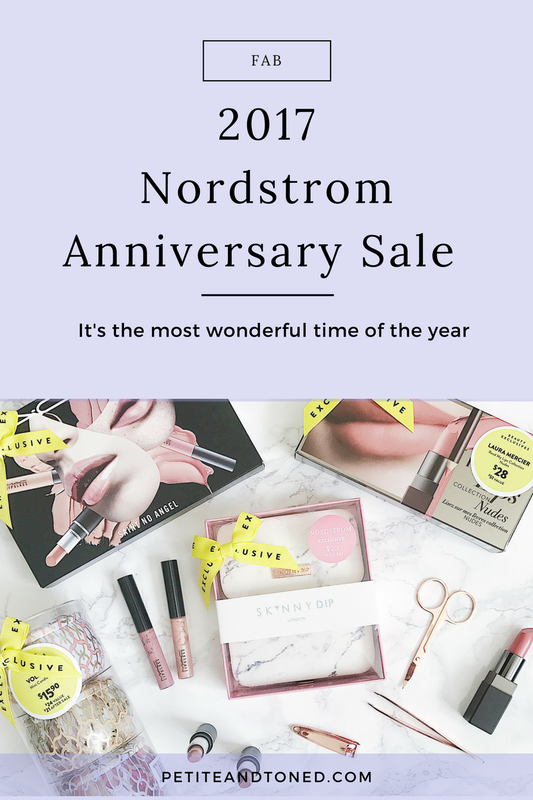 The Nordstorm Anniversary sale is just around the corner and I’ve listed my fave picks in all categories, including fitness, fashion, beauty. I’m currently waiting for things for the home since the main catalog does not feature the home department for some reason. Now that the sale has started, I’ve updated this post with all the things I’ve either purchased or am currently coveting. I love this sale because you can score great deals on staples good for the next season or even next few years. I typically shop online right at midnight once the pre-sale is available on Nordstrom’s website. If I know the item will not be available at my local Nordy’s, I order it, perhaps in two sizes and figure the rest out later. Great deals are sure to go fast. It might seem ridiculous to order a dress in two to three sizes, but trust me, you will regret it if you realize you needed to size up or down by two whole sizes! My current concern is that a bunch of these items are already sold out, but my hope is that Nordstrom is just waiting to release inventory once the pre-sale starts this Thursday, July 13th! I love updating my spandex collection with perhaps a new pair of leggings from the sale. I also found some cute sports bras I’m interested in. I particularly love Zella and if you don’t have a pair of the Women’s Zella Live In Slim Fit Leggings, I highly suggest investing in a pair. I love these not only for working out, but for my casual tunic days as well. I love how the branding is hidden up near the waist band, so you can’t tell right away they’re yoga pants. Same with the seams – they’re quite discrete. During the sale, I love stocking up on sweaters. Brands I found to be most petite friendly are Halogen and Chelsea28, though Chelsea28 might run big. I will update this should I find bottoms I like, which are very tricky finds for petites, as you know. These bottoms might have some potential. I personally love Paige and I love how these Verdugo grey ones fit, but I’m not a fan of the raw hem look just yet. Although it doesn’t really matter since hemming these will clean up the raw edge. I’m just looking for a pair that is a bit more snug near my ankles. And of course I had to share my favorite dresses! I love how a dress / romper is basically an instant outfit! This is perhaps the most dangerous section for me as I have a shoe problem, which you can read more about here. I’m known to purchase shoes in sets of three. But perhaps not this year as I’m slightly disappointed in the lack of full length boots, though I did find a few pairs that I am interested in though, like this one from called Carrara by Nine West in a Grey fabric. Besides shoes, I also have a weakness for purses. They DO have the Longchamp bag I was looking for, however, the PINKY color is sure to run out of stock. I love Longhcamp because they are perfect for the commuter girl or for someone packing a very light gym outfit for say barre or Pilates. And let’s not forget my love for some bling. These jewelry finds are sure to add some sparkle to your day. I’m super excited to get this Nadri crossover ring because it reminds me so much of Olivia Pope from Scandal! I love a good lipstick, so I’m happy to find a few promising deals. I also love Flowerbomb perfume and I’m excited that it’s part of the sale! If you don’t have a Clarisonic yet, I think now is a great time to invest in one. I’m also thinking maybe it’s time to upgrade my hairdryer to a T3 in white and rose gold, obvi. I was originally disappointed that home items were not featured as part of the main catalog, but there are so many options online and in store now! I’ve always had my eyes (and nose?) on these Voluspa candles and can’t wait to start using them. And of course, you know that I’m always on the lookout for pretty things that are Instagram-worthy, so here are some of my faves. This S’well bottle, which I love, is bound to sell out! I hope you all have fun shopping the sale. I know it can be stressful. Although you’re trying to snag the best deals in your sizes, you might also have a strict budget you need to watch. Thank goodness Nordstrom’s has a great return policy! So, can’t wait to see everyone’s finds! It seriously is the most exciting time of the year! I allow myself to spend a little more on myself compared to my normal monthly budget. Why not? We’re worth it! This post may contain affiliate links; full disclosures here.